PHOTO COURTESY GOAT FACTORY MEDIA ENTERTAINMENT Alan Schmuckler as Narrator Josh in "The Other Josh Cohen." PHOTO COURTESY GOAT FACTORY MEDIA ENTERTAINMENT The Cast of "The Other Josh Cohen." The performance begins before patrons even sit down. The house lights are up; people are streaming down the aisles, some fidgeting with wrapped candies (which should always happen before, not during, a show), and others balancing their plastic tumblers of wine as they check and double check their seat numbers. It isn't until most of the audience is settled that they notice two black-clad figures on stage with a garbage bag. What could easily be mistaken for a last minute stagehand task is, upon closer inspection, a robbery — and a shabby apartment is slowly being emptied of household wares, electronics, clothes, and refrigerator contents. 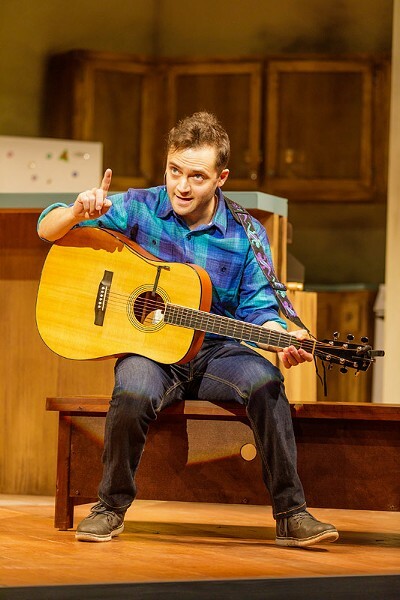 Once the entire apartment is bare except for a Neil Diamond CD, the stage has been set (or, rather, unset) for "The Other Josh Cohen," which runs through February 4 at Geva Theatre. Writers Steve Rosen, a Rochester native, and David Rossmer based "The Other Josh Cohen" on personal life experiences, and premiered it at the New York Musical Theatre Festival in 2010 under the title "V-Day," to great response. An off-Broadway production followed in 2012, garnering six Drama Desk Award nominations and the Lucille Lortel and Off-Broadway Alliance Award nominations for Outstanding Musical. The writing duo had done this before, sort of: together, they created "Don't Quit Your Night Job," an ongoing benefit cabaret show that features Broadway stars and has raised more than $50,000 for Theatrical Development Fund's Open Doors program for high school students. "The Other Josh Cohen" chronicles nearly a year in the life of Josh Cohen (played by Rosen), an overweight, mustachioed, single temp worker living in New York City. As the show opens, it's a few days before Valentine's Day and his apartment has just been robbed. A future version of Cohen (played by Alan Schmuckler) appears, and says Cohen's luck will change within the next year — it's just not clear how or when. What follows is 90 minutes (with no intermission) of high-speed plot development, witty banter, more than 10 finger-snapping tunes, and a seriously multitalented ensemble. The musician-actors play every song live — a drum kit rolls easily in and out of Rosen's living room — and the instruments woven into the plot feel like the musical "Once," if it had the cultural humor of "My Big Fat Greek Wedding." Cohen is Jewish, and both his lineage (explored in the song "Samuel Cohen's Family Tree") and immediate family play into the plot in hilarious ways (listen for the long voicemail message). There's also prominent hat tipping to Neil Diamond throughout the musical styling, as well as in the songs "Neil Life is Better than Real Life" and "Hang On." Geva favorite Hunter Foster returns to direct, and he's an apt fit for musical comedy. This is a storyline that relies on whip-fast pace and seamless transitions sprinkled with a bit of deadpan. Foster and associate director Whitney G-Bowley, who specializes in choreography, guide the cast through each scene, keeping the movement snappy but clearly leaving room for each actor to develop their many characters. Hunter's wife, Jen Cody — another Geva favorite — has a cameo opposite Geva Artistic Director Mark Cuddy on a creative pre-show announcement disguised as a public radio show, projected onset through late-90's-era stereo. 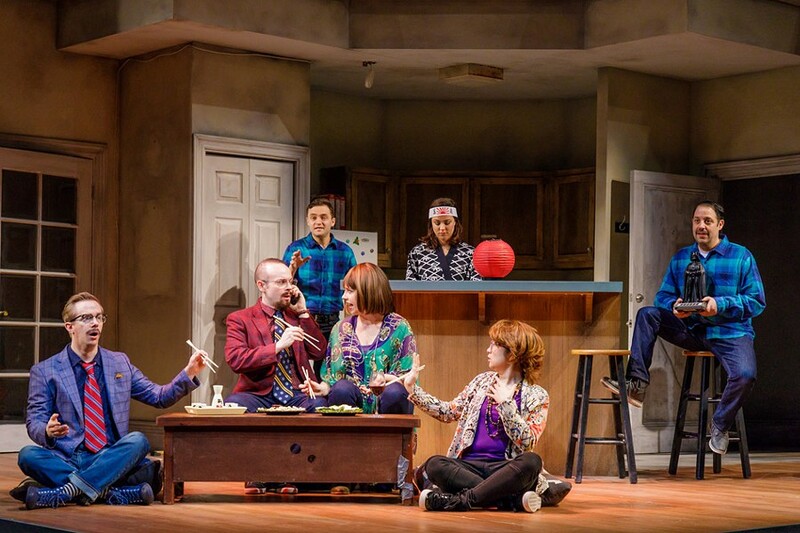 The ensemble — Sarah Bishop, Allison Ann Kelly, James David Larson, Angel Lin, Rochester native Megan Loomis, and Jonathan Spivey — not only nails the comedic genre, but also plays an instrument (or three) throughout the show. Add to this costume and wig changes, accents and movement, and the six-person ensemble is not only entertaining; they're downright impressive. Spivey, in particular should be commended, as he is also the production's musical director. As narrator Josh (Schmuckler) and pre-life change Josh (Rosen), the leads are likeable and formidable as well. Geva regulars may remember native Rosen from last year's "A Funny Thing Happened on the Way to the Forum," in which he won over audiences in the role of Pseudolus. The ambient set design by Paul Tate dePoo III creates a fun, blank canvas for the story, and costumes and wigs by Nicole V. Moody and J. Jared Janas expertly aid in fabricating the many personas in the plot. Aside from the local ties of Rosen and Loomis, there's nothing inherently well-known about "The Other Josh Cohen." But those who make the snowy trek to see the show will be rewarded with 90 minutes of sharp comedy and a profoundly talented cast. And it's OK that it's not Valentine's Day yet — this bright musical warms an unusually cold January and just might leave patrons game-planning for the big day.